As we move closer to vacation time many of us will be planning to make the most of the hot weather. If you're thinking about your next barbecue or day at the beach then you'll also need to stock up on the sunscreen and get prepared to stay safe in the heat. Here are some tips on how to protect yourself in hot weather and avoid heat-related illness. 1. Drink more fluids, but make them non-alcoholic. This is important whether you are outside being active or simply relaxing in the sun. Also, don't wait until you're thirsty to drink. 2. As well as avoiding alcohol, also avoid sugary drinks, as both can actually cause you to lose more body fluid. And very cold drinks, because they can cause stomach cramps. 3. When it's very hot, stay indoors and, if possible, somewhere air-conditioned. If your home does not have air conditioning, go to the shopping mall or public library — even a few hours spent in air conditioning can help your body stay cooler when you go back into the heat. Call your local health department to see if there are any heat-relief shelters in your area. 4. If you have to head outside, limit your time outdoors to morning and evening hours if you can. 5. Electric fans can help you feel cooler and more comfortable, but when the temperature gets really high — think 95 °F / 35 °C and above — fans will not prevent heat-related illness. Instead, take a cool shower or bath, or move to an air-conditioned place to reduce body temperature. 6. Wear lightweight, light-coloured, loose-fitting clothing to help you keep cool. 7. 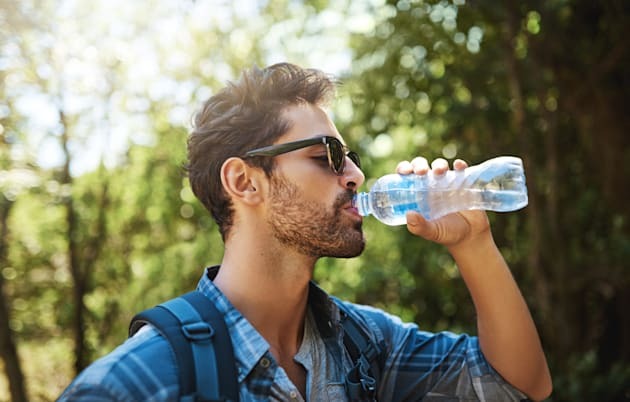 Protect yourself from the sun by wearing sunglasses and a wide-brimmed hat, which will also keep you cooler, and by putting on sunscreen of SPF 15 or higher that offers "broad spectrum" and "UVA/UVB protection". 8. NEVER leave anyone or any animals in a closed, parked vehicle. 9. Cut down on exercise. If you must exercise, drink two to four glasses of cool, nonalcoholic fluids each hour. A sports drink can also replace the salt and minerals you lose in sweat. 10. During the heat try to rest often in shady areas. Although anyone at any time can suffer from heat-related illness, some people are at greater risk than others. For more information on these groups and more advice on how to prevent heat-related illness, head to the Center for Disease Control.